​Cabinets bursting with baking sheets and foil wrap? Take control of the clutter using the 447 Base Organizer with ball-bearing soft-close. This unit features a removable center divider, which gives you the option to create one large storage compartment or two smaller sections. 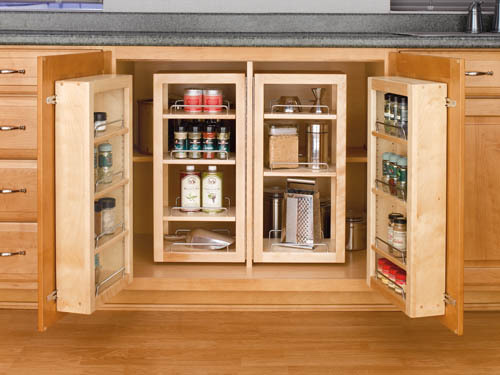 ​Loud slamming cabinets are a thing of the past with our innovative soft-close base organizers. Designed for 9” and 12” full-height base cabinets, they glide effortlessly on our patented soft-close “tri-slides” which minimize any side-to-side motion and provide complete stability when pulled out of the cabinet. An adjustable rear wall prevents items falling behind the pullout and door mounting is easy with our patented door mount brackets. ​One thing is certain. Nothing in this world stays the same. So why would your storage needs be any different? That is why we’ve created an easy to customize pilaster system. The pilaster rails are adjustable to accommodate variable cabinet constructions and avoid hinge obstruction. Available a' la carte or in kits with multiple short and tall drawer options, they are easy to adjust and are perfect for storing sundries, pots and pans, appliances and more! 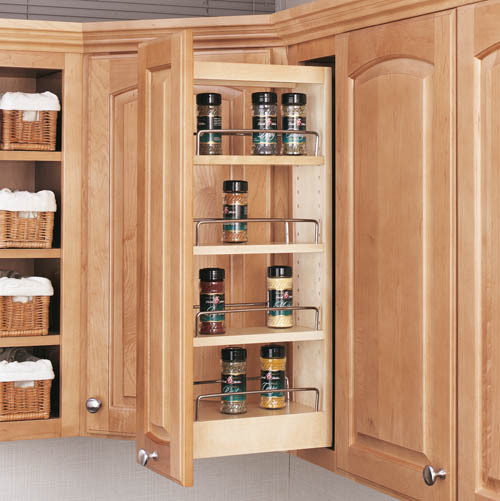 Minimum cabinet opening width: 15 in. Designed for 24 in. deep wall cabinetry Minimum cabinet height: 15 in. 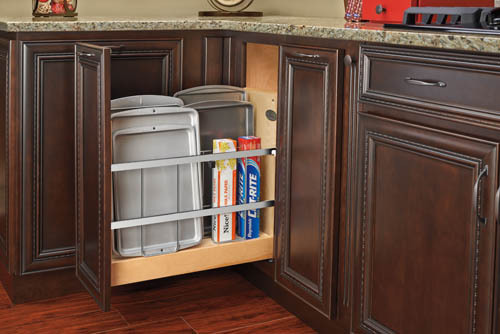 Take advantage of those inaccessible cabinet spaces with Rev-A-Shelf’s Above Appliance Pull out. This door mounted pull out turns hard-to-reach cabinets into functional storage space for everyday items or small appliances. Designed to fit into 24 in. deep wall cabinetry with a 15 in. 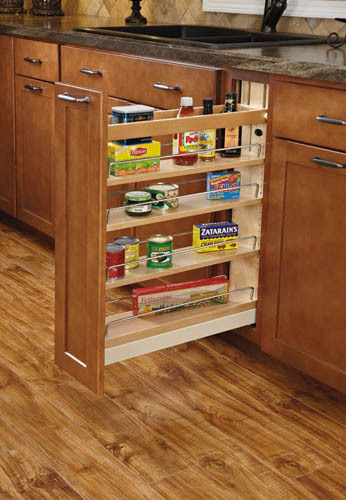 minimum height, this reversible pullout fits either side of your cabinet. Adjustable door mount brackets allow for easy installation, and the attractive chrome wire racks add style to any cabinet interior.